Sawgrass Mills mall, located in Sunrise, is the second largest mall in the state of Florida and the eleventh largest mall in the country! Whether you’re headed there for an all-out shopping spree or a quick "grab and go", you’re bound to find what you’re looking for among the more than 350 stores in Sawgrass Mills. You’ll also find Bed, Bath & Beyond, BrandsMart USA, Burlington Coat Factory, Marshall's, SuperTarget, and T.J. Maxx to round out the "big box" retailers. Specialty stores include a full range of Gap and Limited stores, a Burberry Factory Outlet, a Victoria’s Secret, Adidas, Alex and Ani, All Saints, 7 For All Mankind, Giorgio Armani, Barney's New York Warehouse and many others. If you’re looking for something a little more sophisticated, Sawgrass Mills is also home to a Grand Lux Cafe, Matchbox Vintage Pizza Bistro, Rainforest Cafe, Texas de Brazil, Villagio, Zinburger Wine & Burger Bar and more. Billiard Club at The Oasis is a large upscale pool hall with a full bar and 21 pool tables. It's a great place to have a good time with friends, food, and pool. GameWorks is basically an arcade for kids and adults with adult beverages. It's full of video games and virtual reality experiences. Regal Sawgrass Stadium 23 & IMAX offers 23 screens of first-run movies and more. You can always consult your GPS if you are coming from somewhere other than Miami. Rideshare is also an option, but maybe a bit pricey. 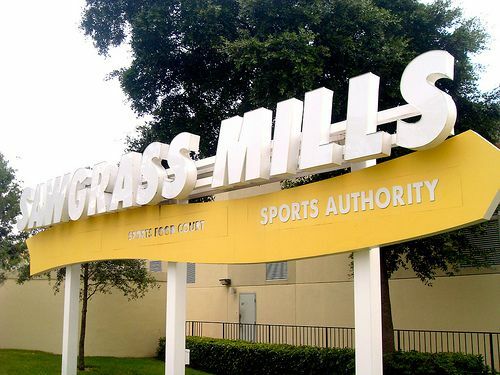 If you’d like more information on Sawgrass Mills Mall, you can view maps and other details on the Sawgrass Mills website.